Browned butter adds an intensely rich, toasty, almost-caramelly flavor to an otherwise simple cookie. M&ms just add a whole bunch of fun! Putting them together into one amazing treat? Maybe a little bit of genius?! You decide! I had to give these cookies away so we would stop eating them. Yum, yum and YUM. If you don’t have a cast iron skillet already, this is my favorite one. And click here for a great resource for caring for your cast iron skillets! *Melt the butter in a 10 or 12" cast iron skillet over medium heat. Continue to cook the butter, stirring often, until it starts to foam. Watch carefully now, still stirring, as it starts to brown and smell toasty and fragrant. In your large mixer bowl, cream together the butter and sugars until fluffy. Beat in the eggs, vanilla & salt until smooth. 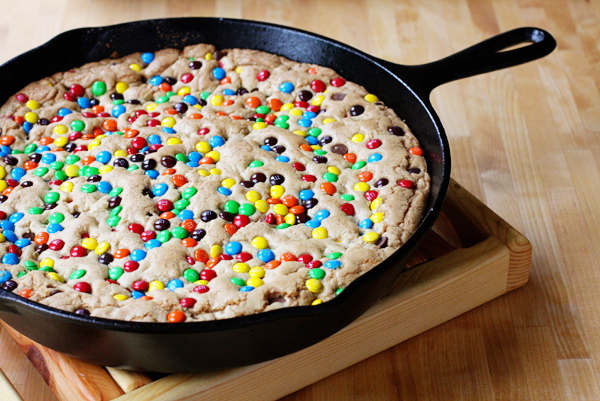 Mix in the flour and baking soda until just well mixed and then stir in the chocolate chips and 1 cup of the m&ms. 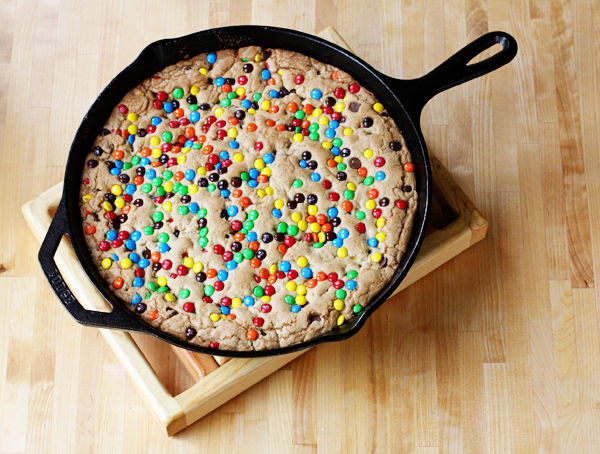 Press the dough evenly into the prepared skillet, sprinkle the top with the remaining cup m&ms, pressing them in gently, and then place in the oven to bake for 25-35 minutes, until the cookie is just set and golden brown around the edges. Cool and then cut into wedges and serve from the pan!